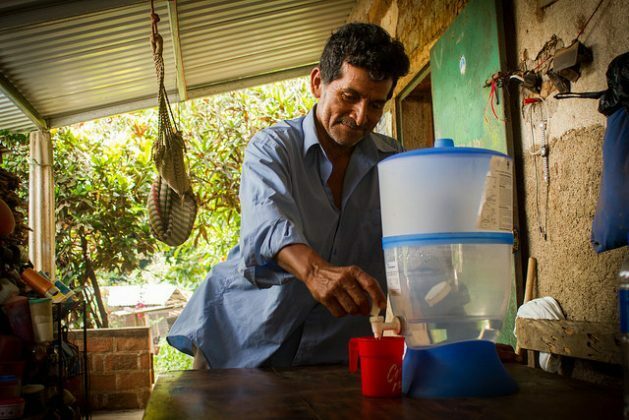 CANDELARIA DE LA FRONTERA, El Salvador, Jun 14 2018 (IPS) - Having a seven-litre container with a filter on the dining room table that purifies the collected rainwater, and opening a small valve to fill a cup and quench thirst, is almost revolutionry for Salvadoran peasant farmer Víctor de León. As if that weren’t enough, having a pond dug in the ground, a reservoir of rainwater collected to ensure that livestock survive periods of drought, is also unprecedented in La Colmena, a village in the rural municipality of Candelaria de la Frontera, in the western department of Santa Ana. “All our lives we’ve been going to rivers or springs to get water, and now it’s a great thing to have it always within reach,” De León, 63, told IPS while carrying forage to one of his calves. De León grows staple grains and produces milk with a herd of 13 cows. This region of El Salvador, located in the so-called Dry Corridor of Central America, has suffered for years the effects of extreme weather: droughts and excessive rainfall that have ruined several times the maize and bean crops, the country’s two main agricultural products and local staple foods. There has also been a shortage of drinking water for people and livestock. But now the 13 families of La Colmena and others in the municipality of Metapán, also in Santa Ana, are adapting to climate change. They have learned about sustainable water and soil management through a project that has combined the efforts of international aid, the government, the municipalities involved and local communities. The 7.9 million dollar project is funded by the Global Environment Facility (GEF) and implemented by the Food and Agriculture Organisation of the United Nations (FAO), with the support of several ministries and municipal governments. The work in the local communities, which began in September 2014, is already producing positive results, which led to the May visit by a group of 13 Brazilian farmers, six of them women, who also live in a water-scarce region. The objective was to exchange experiences and learn how the Salvadorans have dealt with drought and climatic effects on crops. “It was very interesting to learn about what they are doing there, how they are coping with the water shortage, and we told them what we are doing here,” Pedro Ramos, a 36-year-old farmer from El Salvador, told IPS. The visit was organised by the Networking in Brazil’s Semi-Arid Region (ASA), a network of 3,000 farmers and social organisations of this ecoregion of Northeast Brazil, the country’s driest region. Now, six Salvadoran peasants will travel to learn about their experience between Jun. 26-30. “The Brazilians told us that there was a year when total rains amounted to only what the families in the area consume in a day, practically nothing,” Ramos continued. The Brazilian delegation learned about the project that FAO is carrying out in the area and visited similar initiatives in the municipality of Chiquimula, in the department of the same name, in the east of neighbouring Guatemala. “These Brazilian farmers have a lot of experience in this field, they are very organised, their motto is not to fight drought but to learn to live with it,” said Vera Boerger, a land and water officer of FAO’s Subregional Office for Mesoamerica. Life in La Colmena is precarious, without access to electricity and piped water, among other challenges. According to official figures, El Salvador’s 95.5 percent of the urban population had piped water in 2017 compared to 76.5 percent in rural areas. Poverty in the cities stands at 33 percent, while in the countryside the poverty rate is 53.3 percent. 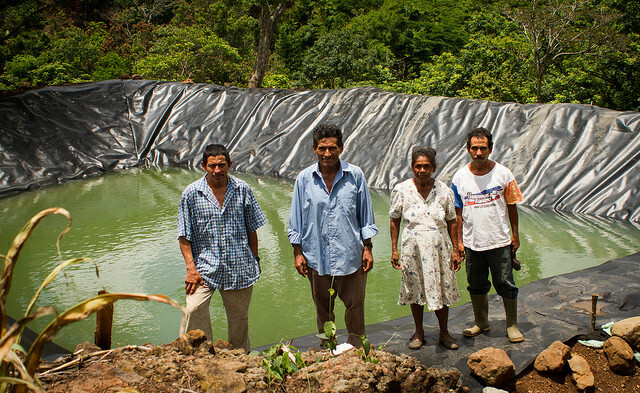 In La Colmena, Brazilian farmers were able to see up close the two reservoirs built in the village to collect rainwater. They are rectangular ponds dug into the ground, 2.5 m deep, 20 m long and 14 m wide, covered by a polyethylene membrane that prevents filtration and retains the water. Their capacity is 500,000 litres. They have started to fill up, IPS noted, as the rainy season, from May to October, has just begun. The water will be mainly used for cattle and family gardens. 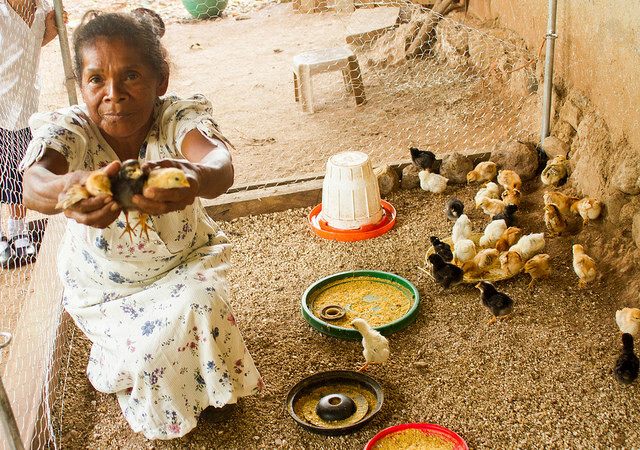 Ofelia Chávez, 63, raises livestock on her 11.5 hectares of land. With 19 cows and calves, she is one of those who has benefited the most from the reservoir built on her property, although the water is shared with the community. “I used to go down to the river with my cattle, and it was exhausting, and I got worried in the summer when the water was scarce,” she told IPS, next to the other pond on the De León farm, along with several enthusiastic neighbours who watched the level of water rise every day as it rained. “Experts tell us that we can even raise tilapia here,” Ramos said, referring to the possibility of boosting the community’s income with fish farming. He added that the Brazilians told them that the reservoirs in their country are built with cement instead of polyethylene membranes. But he believes that in El Salvador that system probably won’t work because the soil is brittle and the cement will eventually crack. “It is possible to use (this design with polyethylene membrane) in some places of the semi-arid region, we can experiment with it here,” said one of the Brazilians who visited the country, Raimundo Nonado Patricio, 54, who lives in a rural community in Tururu, a municipality in the state of Ceará. In the two Central American countries visited, production is concentrated “in two or three crops, mainly maize,” he said, while in Brazil’s semi-arid region dozens of vegetables, fruits and grains are grown, and several species of animals are raised, even on small plots of land. In total, the Salvadoran project financed by the GEF built eight reservoirs of a similar size. Each beneficiary family also received two 5,000-litre tanks to collect rainwater made of polyethylene resin, so they can store up to 10,000 litres. Once purified with the filter they were provided, the water is fit for human consumption. “My wife tells me that now she sees the difference. We are grateful, because before we had to walk for more than an hour along paths and hills to a spring,” said Daniel Santos, a 37-year-old farmer who grows grains. In addition, in the beneficiary communities, living fences were erected with grass, and other fences with stones, on sloping ground, to prevent erosion and facilitate water infiltration, an effort aimed at preserving water resources. Furthermore, 300,000 fruit and forestry trees, as well as seeds to plant grass, were distributed to increase plant cover. For their part, their Central American counterparts, she said, could adopt the “economic garden”, which consists of a large hole in the ground, with a canvas or plastic cloth, which is covered with ploughed soil and buried pipes provide underground drip irrigation. With additional reporting by Mario Osava in Rio de Janeiro. Even with these nobel farming practices, perhaps the greatest and most radical would be planting trees. Starting with tough drought tolerant species as new invaders to hold back top soil and accumulating organic matter while additonally breaking the hardpan to access leached nutrients, subtle microclimatic changes can easily support other freshly plants that could supplement animal feed. And the byproduct manure from the animals would increase organic matter as well ensure better yields. Combating desertification is more important over the long term than higher crop yields in the interim, although the improved food security could be seen as a guarantee of potential investment in soil and water management.